Alas, it is time: Fuji-san. Fuji-san, by the time we were waiting for our bus to go home afterward, was a place I could hardly wait to leave. Alex said to me that he could ‘hardly wait to get off this mountain,’ and I could only agree, and add a mental expletive to the thought. We began just as the rain was ending, shortly after 8pm. The air was crisp and cool and required a jacket while standing still. Once we began hiking, though, the jackets soon came off, and we embraced the beautiful, cool night. And it truly was beautiful. 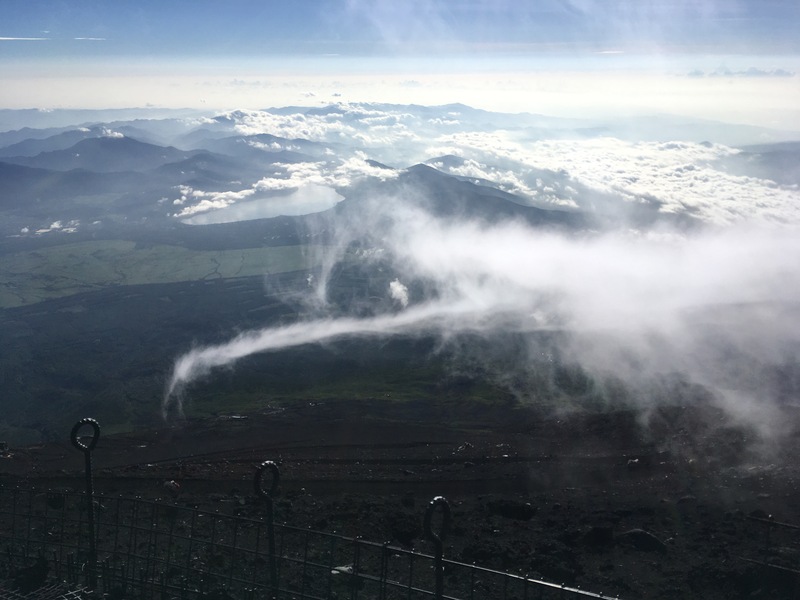 Down below us – for we began at the 5th station, which was already above some clouds – were various thunderstorms taking place. The red lightning was beautiful to watch from above and from a distance. It was like a living, moving painting, it seemed so unreal and so beautiful. The moon was bright enough, we didn’t even need to use our headlamps (and so didn’t). I had been practicing my Japanese listening skills by listening to the couple of Japanese guys walking behind us, so, when I realized that I didn’t know the word for lightning, I stopped them to find out. I knew the word for thunder, but not lightning. The guys were happy to pause and to chat briefly, and I think they enjoyed the small comedy that ensued with my question. Apparently, they are the same word in Japanese, thunder and lightning. So it took a bit of time to clear up that bit of confusion, my saying, ‘No, not kaminari, the other part.’ We also learned that the onomatopoeia for thunder is “gorogoro” in Japanese. That was a fun conversation to have. And it was representative of my mood at the time – things were wonderful and on an upward slope. Unfortunately, at somewhere around 3200 meters, that mood had disappeared. 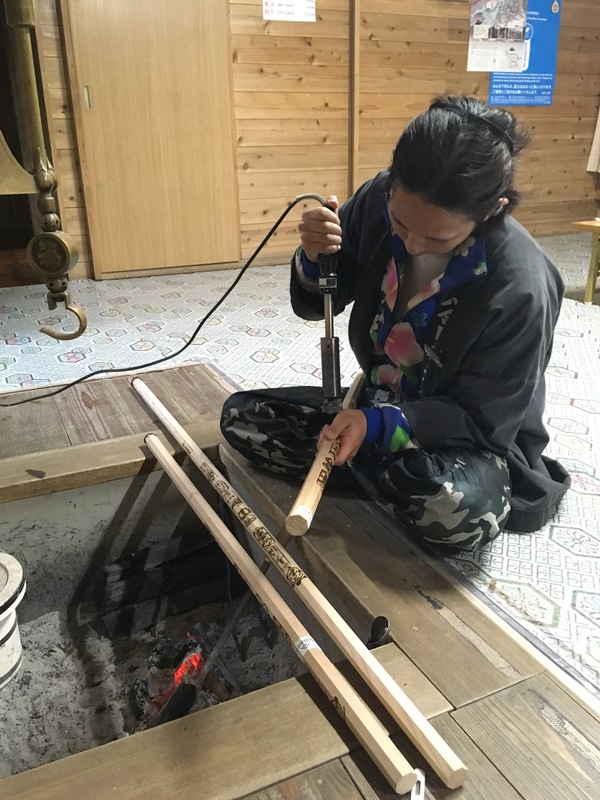 I was getting the really cool stamps that the different little huts and stations burn into people’s walking sticks, should they desire and pay a small fee (200-500 yen), and that was awesome. But I was getting tired of the constant effort. My calves were getting a bit sore, but everything else seemed okay-ish. My back/shoulders began hurting somewhere around there, too, from carrying my backpack filled with water and cold-weather clothing. By the time we were getting close to the top, – about an hour hike remaining – the path started getting crowded. We had several points where we were actually kind of stuck behind a line of slow-moving people*, and we couldn’t go around. As the sun was getting close to breaking the horizon, the end was in sight, but a lot of people blocked the way. We were literally climbing over rocks to go the hard way on the path, so as to get around the slow-moving crowd. One of the workers whose job was to keep people moving to the top helped me out as I crawled up a particularly large chunk of rock. I didn’t need the help, because I had plenty of arm strength in me still, but it was sweet nonetheless. 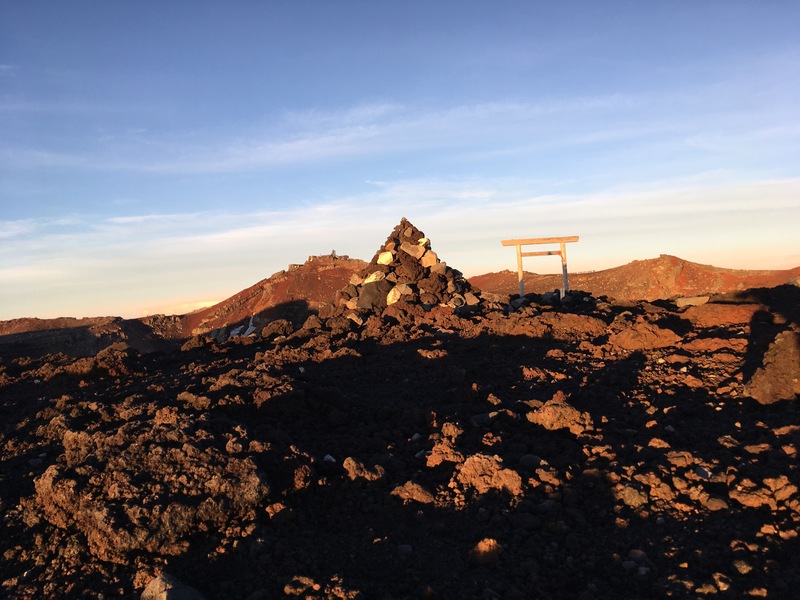 At last, the path was just open enough, and I had the tori gate in front of me, declaring the top of the mountain. I had about one minute, I could tell, before the sun would pop up, and so I rushed to find my small crew. 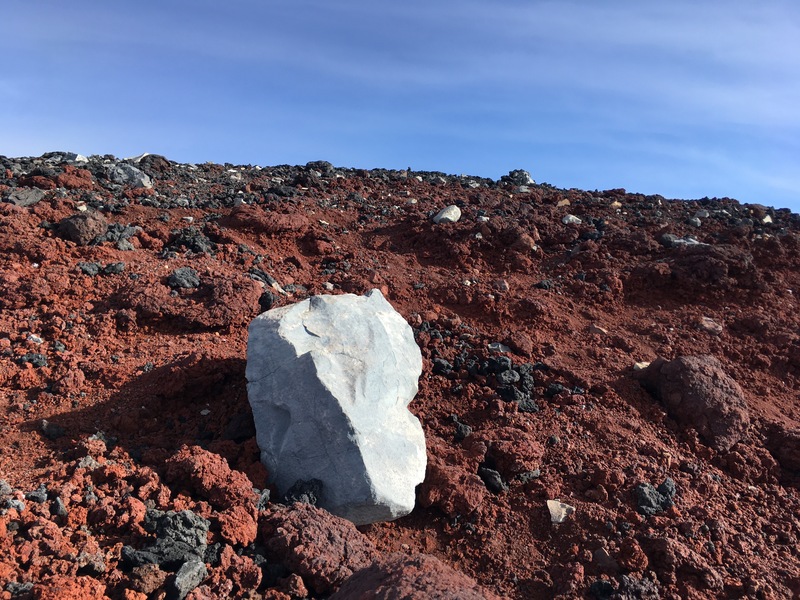 When I realized I would only find them after the sun came up, I rushed up a path into an open space, bolted for a two-rock formation that was like a chair, and sat myself down to watch the sunrise. My timing couldn’t have been more perfect. Within ten or 15 seconds, the sun popped up on the horizon. It was totally cool and beautiful and all, and I cried. And I was also a bit furious. “Really? I went through all of that just for this? It’s a freakin’ sunrise.” I can see those on almost any given day, seeing as it’s a daily occurrence and all. But I still enjoyed this one. 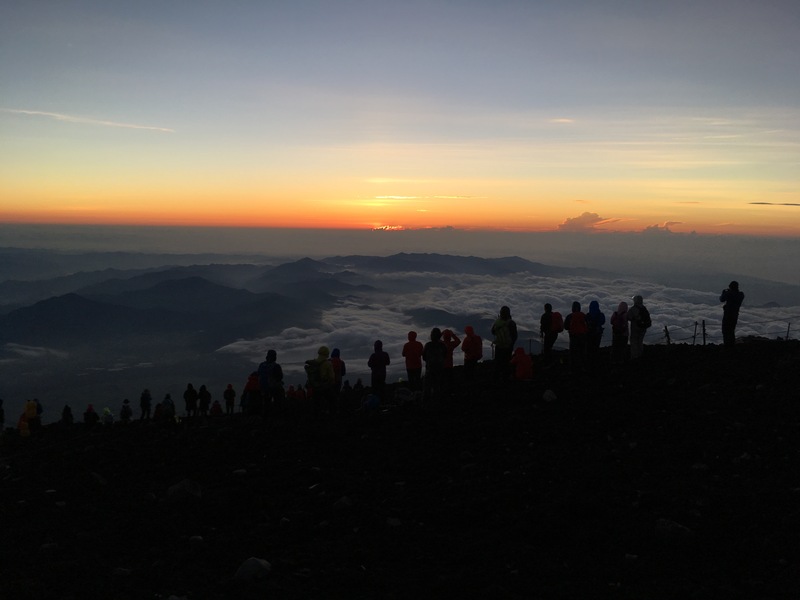 I mean, come on – who, in normal life, really gets to brag about having watched a sunrise from the top of a mountain? So that’s kind of cool. Anyway…., now to talk about the good bits, instead of how much I disliked it all. Hiking the mountain as we did, beginning at night and hiking to sunrise, is not the recommended route. We did not pay more money than we had to attempt rest on an uncomfortable floor in tight quarters with stinky people, only to get up a few hours later to start hiking some more. Most people follow the suggestion of doing so, though, or else hike the full thing during the day (too hot, so no, thank you). This means that the night hikers are, for the most part, on their own. This is not to say that we were the only actual people around. Merely that we had our own space and pace, and only crossed others briefly from time to time. The higher we got, the more people we crossed. But it was generally calm and quiet for more than the first half of our hike. The other people who were hiking, became almost like friends. At each station, as we would pause, we would get to chat with others who were hiking. Those with similar paces were often at rest spots around the same time as we were, and so we had these small chats multiple times. And the chatting, really, wasn’t too much of chatting. At first, it was, when we would interact with someone for the first time or so. After that, though, it was more like just hanging out together. We would talk or not, but we had an understood conversation of something along the lines of, “Man, oh, man… this mountain…” to varying degrees of stress, fatigue, and thoughts of, ‘Are we all just a bit crazy?’ It was really, really cool, and I thoroughly enjoyed the relationships that occurred throughout the night. I mentioned Alex before. Alex is a Canadian from Ottawa whom we met shortly before beginning our hike. 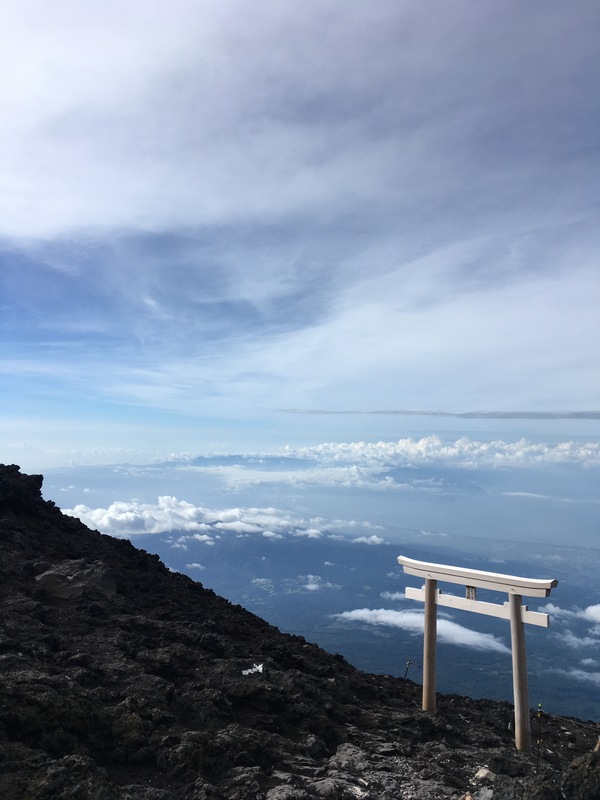 My friend Casey and I were hanging out at the 5th station, waiting for 8pm to arrive and the rains to be finished, and I noticed a guy who seemed to be solo, and who also seemed to be an English-speaker (based on the fact that he clearly understood our conversation). I started conversation with him, discovered that he was, in fact, solo for the hike, and that he was planning to leave at the same time we were. It became understood that he could hike with us, if he desired. And so, he did. Alex was wonderful company, and was an invaluable helper on the way down from the mountain. 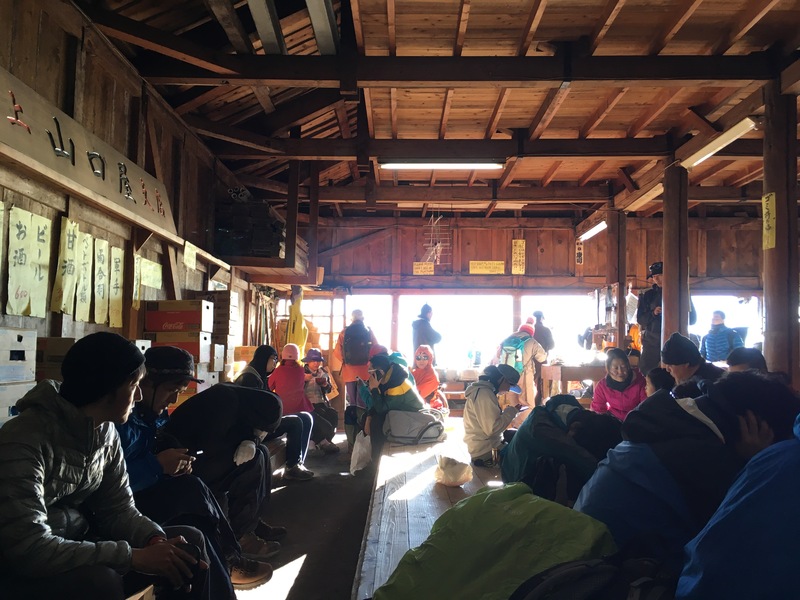 When the announcement that ‘the typhoon is coming sooner than expected, so get off the mountain asap’ occurred, I had not yet rested enough atop the mountain. My strength was somewhat nonexistent, simply due to a lack of sleep and food and rest (plus the altitude, but the sleep and food were the main parts). Alex took my backpack for me, and carried it the majority of the way down the mountain (maybe around 2/3 of it) for me. He was an absolute star. For that and for more, I am incredibly grateful that we found him and got to hike/climb with him. At one point, Casey and I had a bit of a mini-adventure of our own. One of the troubles of hiking/climbing in the dark is that things are sometimes difficult to see. (Uh, duh…) Well, on the mountain, there are parts of the path that aren’t obvious based on the ground, and so little ropeway things are set up to guide climbers the correct route. The mountain workers near the top actually would yell at people for going outside of these ropes. So they’re for guidance, but a huge part of that guidance is safety for the climbers. Well, we had an adventure with one of these ropes. Casey and I are walking the path, and up ahead of us, we see a rope appearing. We turn and look uphill, and see that there seems to be another rope up a ways over to the right. So, the path curves to the right here. We begin the ascent toward the second set of ropes, I in front and Casey following, and quickly discover that the footing is terrible. I express my concern to Casey, and that I can’t seem to get myself up the path (this was a climbing area, not a walking one). He gives me some support and a good push, thinking it must only be one small patch of hard-to-handle earth. Within a few seconds, I tell him that I cannot go up, and, unintentionally, then slide back down a few feet on the slippery earth that I cannot seem to grip in any way. There are people behind us as we are doing this, waiting for us to get a move on. We both have the same thought, though: This can’t be done. And, as a follow-up, If this is truly the path, then our ascent of this mountain must end here, because we can’t make it up this path. We looked up again, and saw people walking alongside the other roping up and to the right of us. None of them seemed to have just gone through any sort of tremendous struggle as we were currently facing. 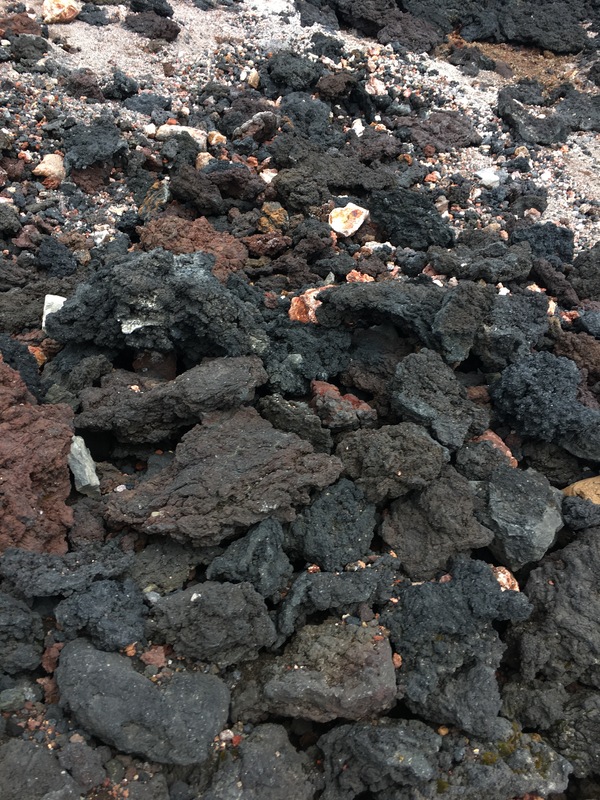 Our hearts were sinking – were we just that bad at climbing, that unprepared? And then Casey saw it. If this had been daylight, we’d have had no issue. Casey took a second to turn around, and happened to look way to the left (now his right, since he was turned around). Another rope! In true Japanese fashion, the ‘signage’ was dreadful. Yes, the path turned to the right there, but we needed to be on the left side of the rope, not the right. And yes, the rope I’d seen up ahead was where we were supposed to go, but we needed to take a path about four meters to our left in order to get there. Casey then helped me up (or, rather, down) from my sprawled-out position on the impossible patch, and we both regathered our confidence. 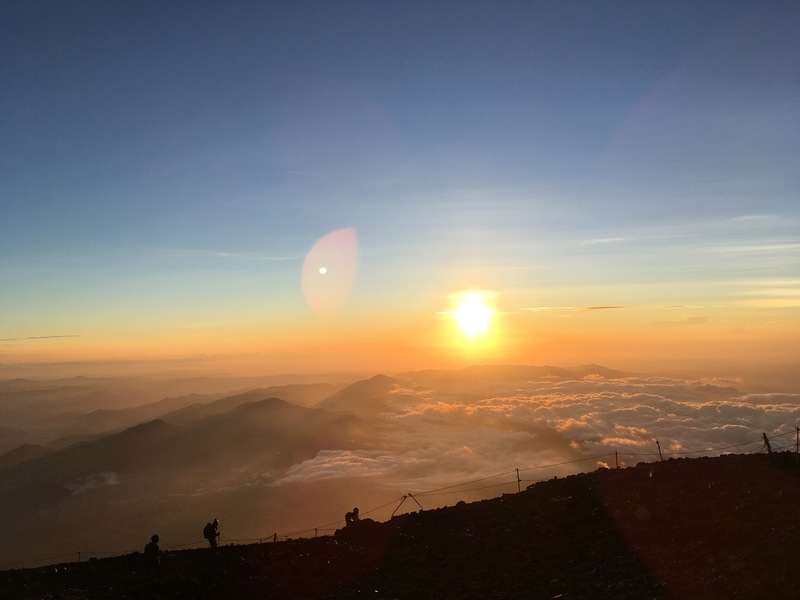 As we laughed heartily, – though not too loudly, due to the fact that our lungs couldn’t handle too much with such altitude – we discussed our mutual thoughts from that dreadful and fear-filled 30-ish seconds we had just experienced. 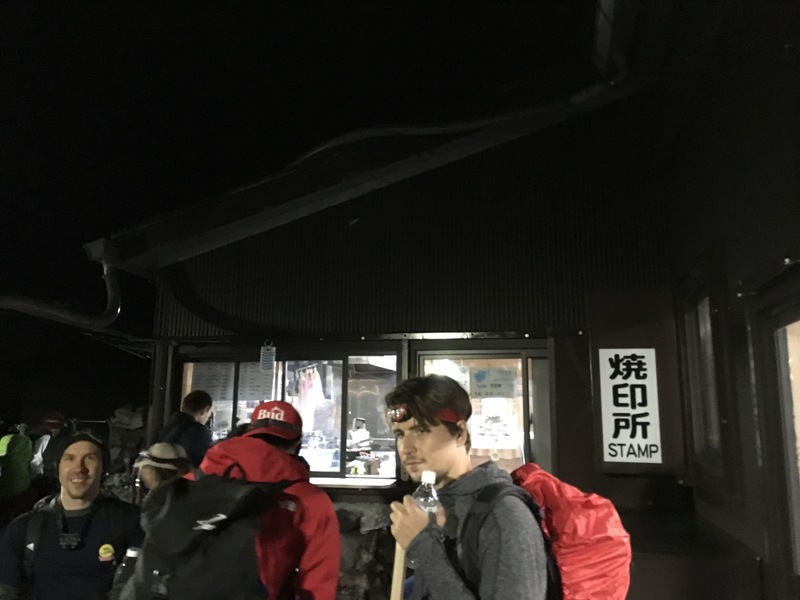 Casey said that he would contact me in twenty years, and ask if I remembered that time we utterly failed on Fuji-san, and almost had to give up the whole climb, because we tried to climb a dangerous, non-path. At the top, I mailed two post cards – one to my mother and one to my post card pal in Ottawa (crazy coincidence, right?) 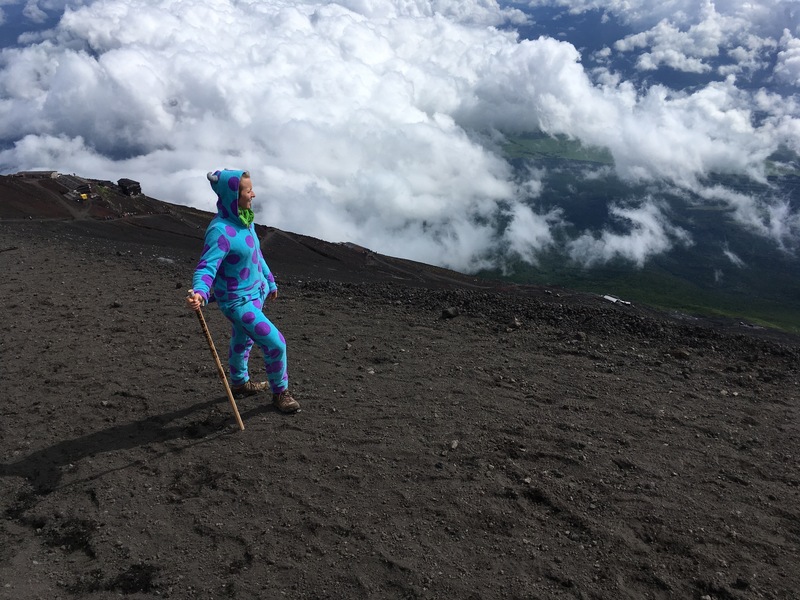 – and then used the bathroom, and went and sat on the rim of the volcano that is Fuji-san. (Some other things happened before all of this, but I don’t much care to share about any of it right now.) I’m not entirely sure I was supposed to do that, but I didn’t care. I was tired and needed to sit down and eat something. Japanese food generally just makes me sick, so I figured it wouldn’t be good to have Japanese food with Casey and Alex when they ate at the little restaurant-esque place after sunrise. 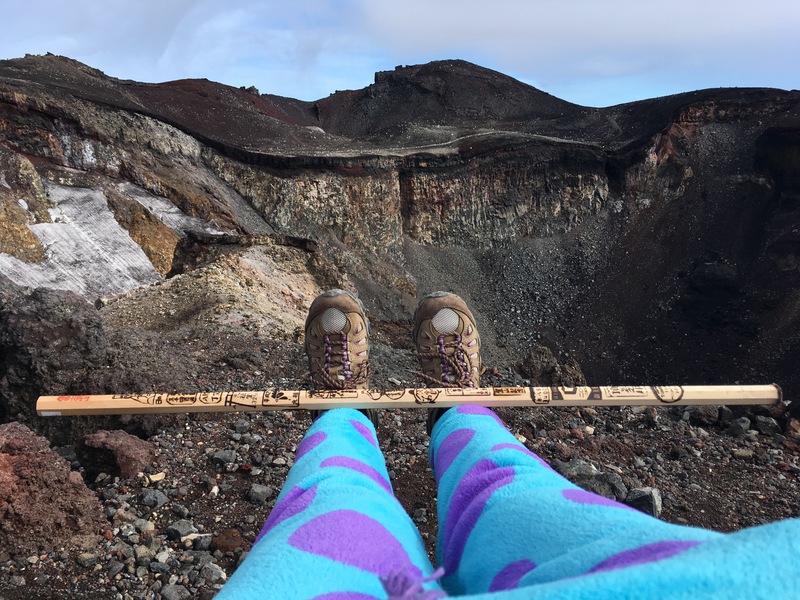 So, I hung my legs over the edge of the crater, as I called it, and munched. The ice on the inside was really cool to see, as well as how the clouds just kind of appeared from the crater itself as the wind blew. One of my favorite parts of the whole adventure was looking down upon the clouds, as though there were something on the ground (or perhaps their own sort of ground). Occasionally, we were inside the clouds, and that was cool, too. But it was just amazing, being able to look down and see clouds below, but be sitting in the wide and open air (as opposed to being in an airplane). The wind was petrifying elsewhere, but in that particular spot, I felt little of it. As I did my time lapse of the sunrise, I felt like my phone might be ripped out of my hands. And, as I walked to the post office, I felt like I, myself, would be thrown from the mountain top, so strong was the wind and so little coverage and places to hold on were there at times. I’ve never been more scared in my life than I was dealing with that wind at times. However, in my cozy spot, the wind was slight enough that I don’t even remember thinking anything about it. I took a photo with my cool hiking stick, which now had all of its stamps (well, all the ones it was going to get – I hadn’t known that certain stations even had stamps at the beginning, so I didn’t have any of the really low stamps, aside from the 5th station, which was where I bought the stick), because I figured it to be the best place for such a photo. And I just enjoyed myself for a bit. Too soon, I got notification from Casey that we had to rush down to avoid the typhoon, and so got up wearily, and began heading back to the trails. I had intended to take some really cool photos up top, and even brought my Japanese flag that was given to me the other week at our leavers’ party. However, I truly just didn’t care enough at that point to bother. I had given up on the photos before I’d even headed off to the post office. I was just kind of done. 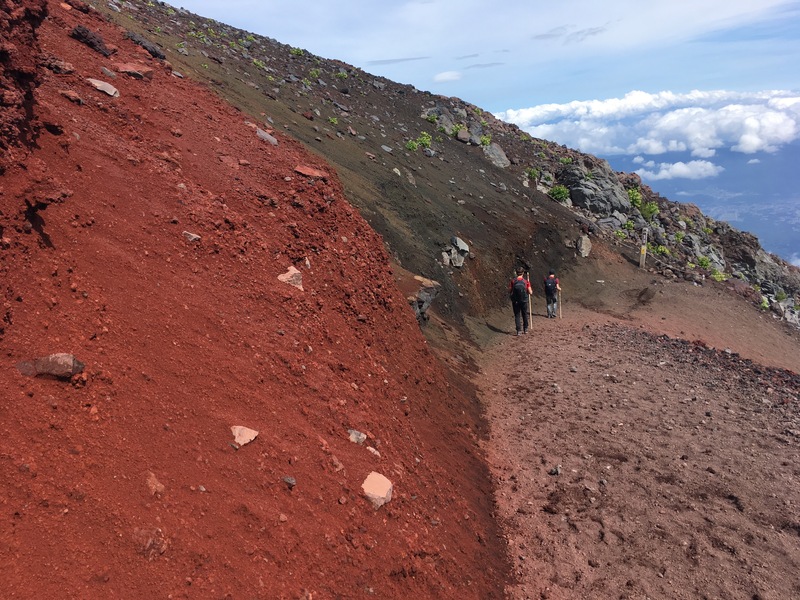 So, we headed down the miserable descent, throughout which we were covered with red and black dirt that felt like it was attacking us in the strong winds. We needed bathrooms, and only two sets were to be found on the entire descent, both too near the bottom to have left us in good moods for most of the descent. We needed water, which was abundantly on sale on the way up the mountain, but which was nowhere to be found on the descent. 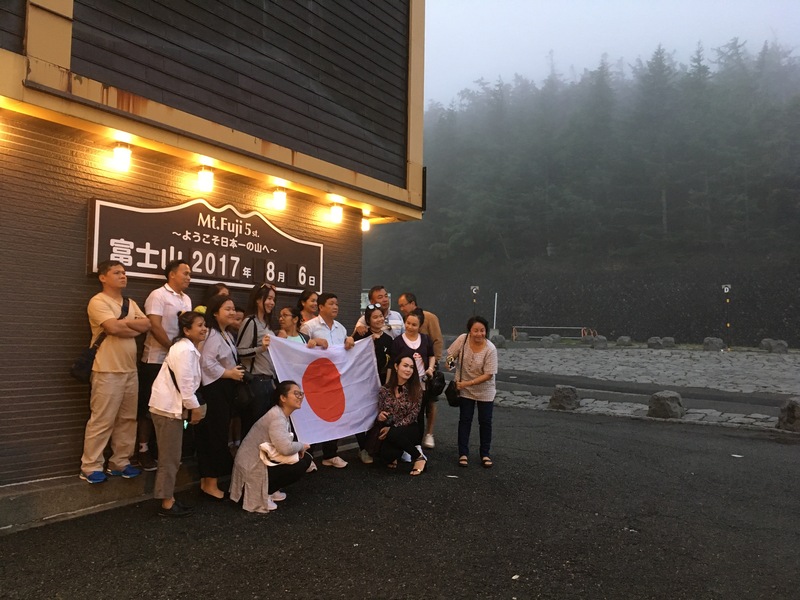 Finally, we made it back to the 5th station, and not one of us was in a very good mood. Casey changed his clothes and wiped himself down, and then we all had lunch as we waited for the bus Casey had just booked for us. After lunch, I got my photo with my Japanese flag. Before we began our hike, as we were hanging out at the 5th station and had just met Alex, someone asked him to borrow his hiking stick. 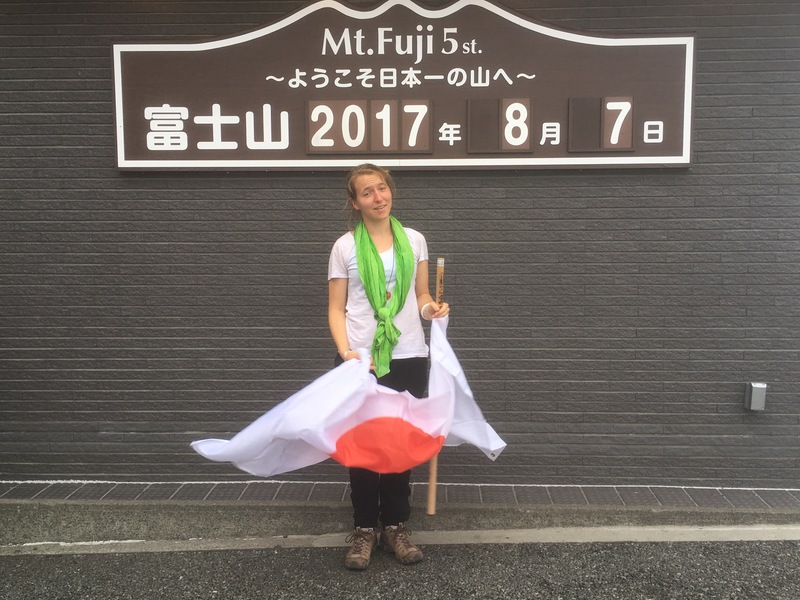 He’d purchased one of the tall ones that had a small Japanese flag and a bell on top of it, and some foreigners wanted to have it in their photo with the Fuji sign. I then pulled out my actual flag and offered it to them. They were overjoyed. About 15 minutes, what seemed like a hundred photos, and many families later, my flag was returned to me by the original delighted family. It was in this same spot that I got my own photo, but with a different date on the sign. I was proud of my accomplishment. And, though I almost couldn’t have cared less about photos for showing others at the time, I had enough sense in me to know that I would want the photo later on, when I wasn’t beyond ready to get off the mountain. And I was correct. I was correct, too, in my guess while hiking that, though I was struggling through and hating the hike at the time, I could only imagine that I probably would feel as though it had really been not too big of a deal, and , yeah, of course I could do it again. I look back now, and I kind of wonder what was so difficult, why I so disliked it and was so miserable. 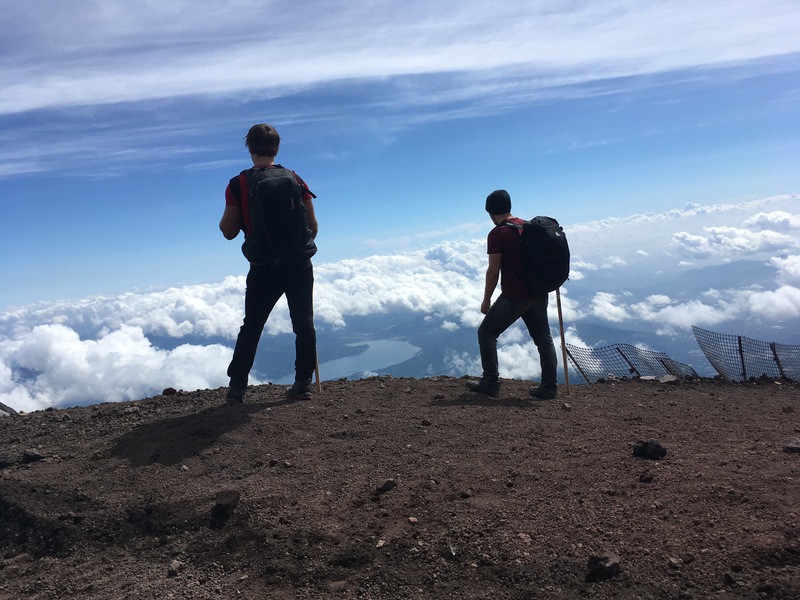 I fully recall, however, that, in the moment, I was truly miserable and almost didn’t care about the hike, and that I never wanted to do anything like it again. 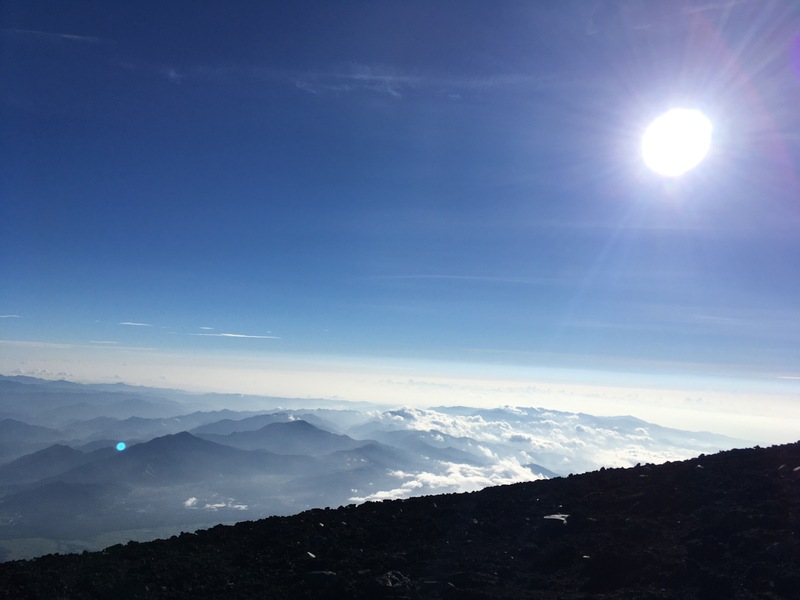 Nonetheless, I am glad that I hiked Fuji-san. It was a wonderful experience, and an amazing accomplishment, especially since it was such a mental struggle for me. It was a good mental and physical exercise for me (even though it has left my toes on my left foot tingly and numb the past 30-ish hours), and I am grateful for the experience and the opportunity. 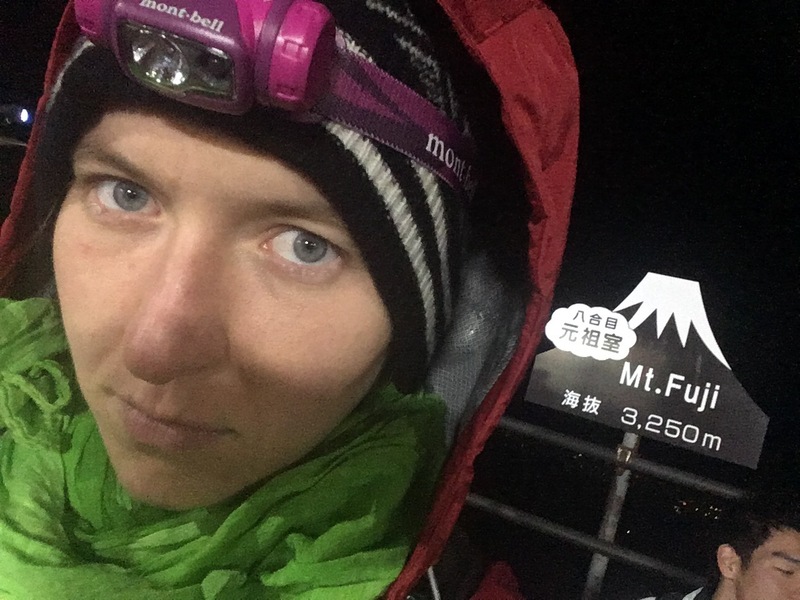 And, if anyone, including myself, ever wants to do something like hike Fuji-san, I suggest, as I mentioned to Casey, doing something like hiking Tsukuba-san three days in a row as as test for preparation. If you can do that, then you can handle Fuji-san decently. If you don’t do that, then you’re all too likely to hate life for about 16 hours. P.S. 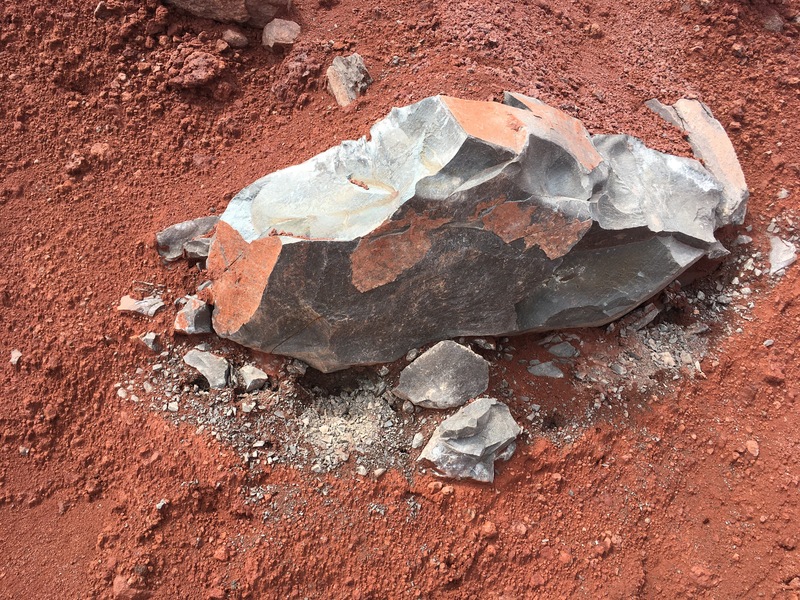 Oh, and the rocks and dirt were absolutely beautiful up top! Previous Previous post: Later, dude!